In the part of the verse which I just put before you, Allah refers to the second mosque of Islam, i.e. the Masjid An-Nabawwi which the Holy Prophet Muhammad (pbuh) and his companions and followers have built for the worship of Allah. It was the second mosque for which the Holy Prophet Hazrat Muhammad (pbuh) laid its foundation stone (after Masjid Quba) and helped actively in its construction by carrying rocks and other materials to build it. It is such a mosque whose foundation was thus also laid from its very beginning on Taqwa, i.e., piety, righteousness, and the fear of Allah. And this mosque also was named ‘The Mosque of the Prophet’. The consensus among the Ulama of Islam has established that the verse refers to Masjid Quba, found in the outskirts of Madina, which Hazrat Muhammad (pbuh) helped to build during his brief stay at Quba before entering the centre of Madina and thereafter built the Masjid an-Nabawi, the Prophet’s Mosque. The verse as a whole includes both mosques of Islam, but the mosque absolutely founded on Taqwa is the Mosque of the Prophet. In the light of a Hadith found in Tirmidhi and An-Nasai, and narrated by Hazrat Abu Said Al-Kudri (ra), it is found that the Holy Prophet Muhammad (pbuh) has referred to that mosque (mentioned in Verse 108 of the Surah At-Taubah) to be his mosque, i.e. the greatest mosque after the Ka’aba in Mecca, the Masjid-an-Nabawwi. In another version (by Said Al-Kudri), it is said: “A man from Banu Khudrah and a man from Banu Amr bin Awf were disputing about the Masjid that was founded upon Taqwa. The man from Banu Khudrah said: ‘It is the Masjid of Allah’s Messenger.’ The other one said that it was Masjid Qub. So they went to ask Allah’s Messenger about that. He said: ‘It is this - meaning his Masjid - and in that [other] one (Masjid Quba) there is much good.’” (Tirmidhi). It is clear from these Hadiths that the Prophet of Allah meant His Mosque, though people confused Masjid Quba to be his mosque as well, but the decision in the dispute refers clearly to the mosque of the Prophet of Allah, whom the Prophet Himself considered as His Mosque and fully blessed and based or founded on Taqwa. Besides, the Holy Prophet Muhammad (pbuh) is narrated to have said: “No (religious) journey is to be undertaken except to (pray in) the three mosques: The Sacred Mosque (Makkah), the Aqsa Mosque (Jerusalem), and this Mosque of mine (Madina – Masjid an-Nabawi).” This Hadith is found in Sahih Bukhari. Sahih Muslim, Sunan at-Tirmidhi, Sunan Abu Dawud, and Ibn Majah among others also recorded it. Moreover, at the time of the dispute, we get to know that both the Masjid Quba and the Masjid-an-Nabawwi were in operation, and in that time itself, people had confusion about to which Mosque Allah was referring to. And the Holy Prophet Muhammad (pbuh) clearly removed any misconception about it by sealing his decision by saying it was his Masjid: ‘Huwa Masjidiya Haadha’ (i.e. This Mosque of Mine). So, both the Quba Masjid and the Masjid an-Nabawi have a special place in the sight of Allah and His Messenger (pbuh). For both mosques, Hazrat Muhammad (pbuh) participated actively in their construction and laid their foundation stones, in both the physical and spiritual aspects of the words and they were established one after the other in one same town, i.e. Madina. And both mosques are both mentioned in connection with Verse 108 of the Quranic Chapter, At-Tawbah, and this is evidenced plentifully in the Hadiths. As concerning the part “There is a mosque whose foundation was laid from the first day on piety”, Hazrat Muhammad (pbuh) has clearly given us its reply, by indicating to his Mosque, instead of taking the name of the Quba Mosque. Remember, my dear ones that every construction needs a very strong and lasting foundation, a very solid base. And for every construction, there should of course be a first brick or stone which is used to begin the construction. In the case of a Mosque, Allah looks not only at the actual laying of the bricks for His mosques, but He looks at your heart also, with which intention you are doing it. Those who are pious, and who seek to reach the nearness of Allah are those who make the maximum efforts to reach their Goal safe and sound, in all security and with the pleasure of Allah. A foundation stone for the mosque of Allah is therefore very important, because it is not just a stone or brick, but also a promise of durability and the efforts behind to set up a House exclusively for the worship of Allah. 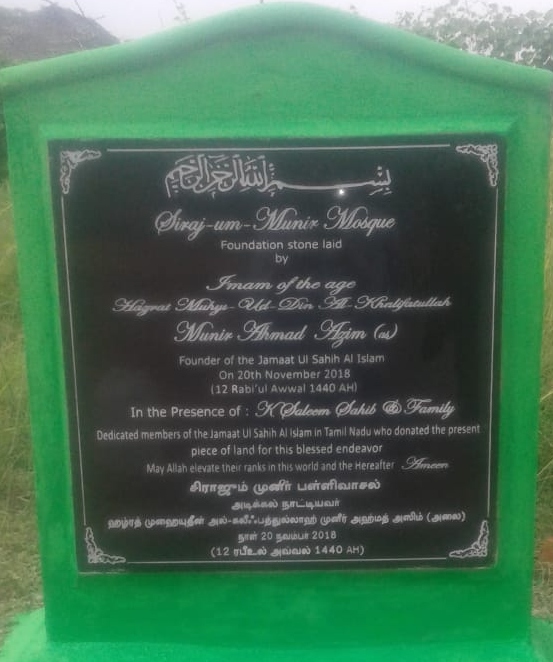 For our era, and in a piece of land in the vast state of Tamil Nadu, in India, we are therefore very fortunate that Allah has directed the heart of one of our brothers, and his family members also to donate a piece of land for the fulfilment of the projects of Allah; i.e. to build such a mosque which shall be used as a centre for the worship of Allah and as a centre of learning in Tamil Nadu. Indeed, without a land, a mosque cannot be built. 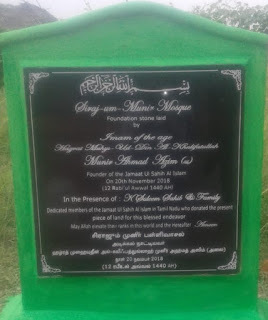 Therefore, a land for Islam, for the Jamaat Ul Sahih Al Islam was essential for us to acquire, to set up a Mosque and Centre for our members in Tamil Nadu. And Allah by His everlasting grace has enabled this. All praise be for Him. Indeed, He is the One Who opens closed doors and enables the progress of the Divine Manifestation in all the directions. Allah encourages both men and women in the Holy Quran to excel each other in good deeds. But it all depends also on their ability to exceed what is expected of them by realizing the full potential of their character and personality, and by fulfilling their responsibilities. For this reason, believing women do not struggle for equality with men, but exert themselves in the race to do good, defined in the Quran as the effort to win Allah’s pleasure. So when a man makes the intention to donate a land for the construction of a mosque, and/ or, to construct a Mosque for the pleasure of Allah, it should be borne in mind that when doing so, his wife and children also are contributing to it, because as a family, as a united entity, they have decided to do so, to acquire the pleasure of Allah. Men and their wives, and their daughters and sons all have roles to play in the matters of the true faith, i.e. Islam. There are wives who play a key role in encouraging their husbands to spend in the cause of Allah, while there are others who discourage their husbands from helping the cause of Allah. They fear that if a piece of land or finance is given for the construction of the Mosque of Allah or for other projects of Islam, and of the Jamaat of Allah, they would incur losses. But this is a wrong thought, and I strongly encourage all men, women and children of the Divine Manifestation not to ever have such thoughts, because when you sacrifice for the sake of Allah, this sacrifice is NEVER lost. It may be that the rewards of your good deeds may delay in coming to you, but it WILL come to you. It may be that you expect that such rewards come to you in this life itself, but it may be that Allah has accumulated all your good deeds and intentions and decided to give you a beautiful package, filled with a complete set of His blessings and rewards in the hereafter, which shall be eternal for you. Hazrat Muhammad (pbuh) has said (and narrated by Hazrat Uthman bin Affan (ra)): “Whoever builds a mosque for Allah, then Allah will build for him a house like it in Paradise.” (Bukhari). Therefore, not only men but women also should race to become the person most loved by Allah so that they may win His good pleasure and be the nearest to Him, be it in this life as well as in the Hereafter: Allah says in the Holy Quran: “Such people are truly racing toward good things, and they are the first to reach them.” (Al-Mu’minun 23: 62). May Allah blessed this day for us in history, in the month of Rabi’ul Awwal 1440, and November 2018. May Allah accept this Mosque project as one founded on Taqwa, and may you all, men, women and children work hard to fulfill and complete this Mosque which foundation stone has been laid by this humble Messenger of Allah of this era. May Allah accept this from us, and enrich us in finance and knowledge for the propagation of His Deen (Islam) throughout the world. Insha-Allah, Ameen.